Expiry day saw the index opening positive above 5300 level and stayed firm till end of day, with a small sell-off marring the perfect day for the Bulls. Nifty closed the day with a huge gain of 124.05 points to close at 5409.05, just above the psychological level of 5400. The broader market was also strong, with 782 advances to 498 declines. 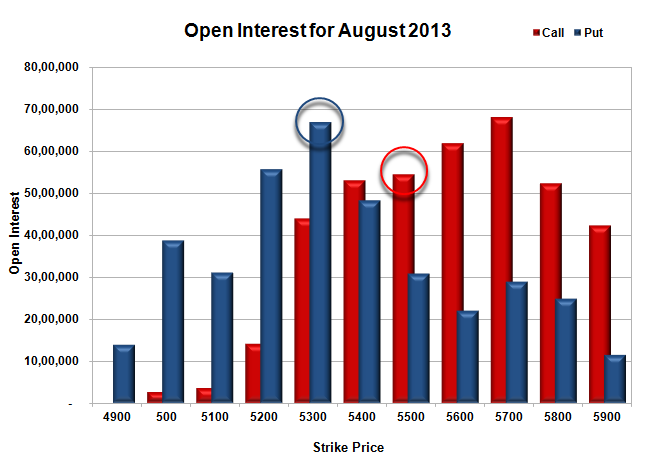 Based on Option Table, the initial range developing is 5300-5600. Call option 5000-5900 added 32.29 lacs huge amount of OI. Put option 5400-4900 added 34.97 lacs huge amount of OI with short covering seen at 5500 strike prices. 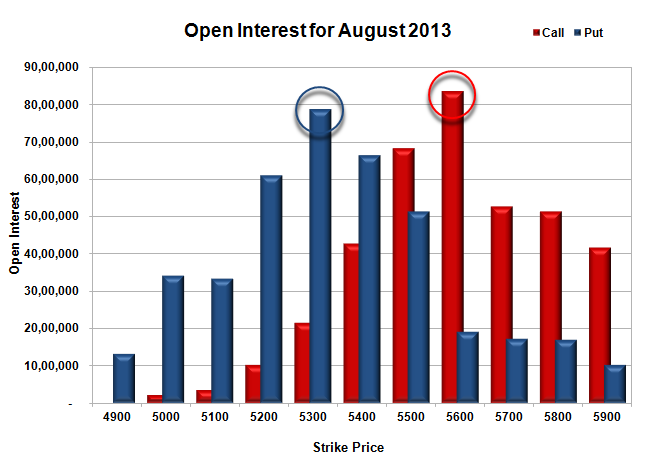 Nifty Open Interest is at 1,46,50,400 up by 19,41,650, with increase in price, most probably huge long build-up. 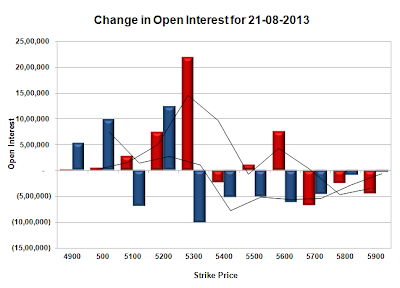 Bank Nifty Open Interest is at 21,43,050 up by 2,51,275, with increase in price, most probably huge long build-up. FII’s bought 10.77 lacs Futures, mostly short covering, as their net OI decreased by 387618 (includes profit booking in shorts and some long liquidation) contracts and the average price per contract comes to around 5158.68. FII’s future open contract as on date is 347099. 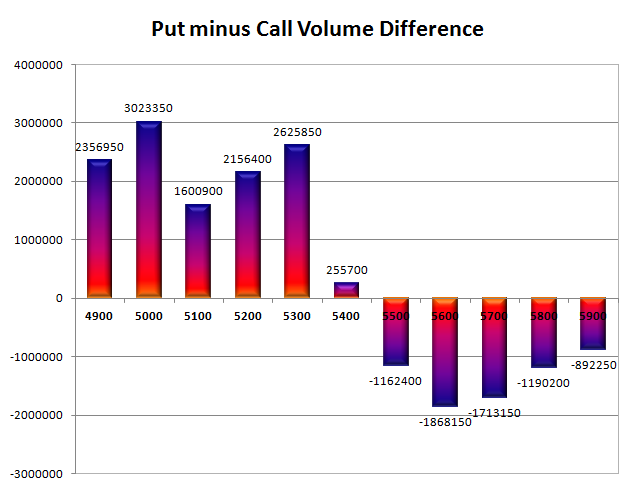 PCR Open Interest (Volume) at start of series is healthy 1.382. Best Support developing at 5300, with highest OI of 45.28 lacs, and below that at 5200 with huge OI of 36.52 lacs. Resistance at 5600, with OI of 26.51 lacs and above that at 5700 with OI of 25.10 lacs. Day Range as per Option Table is 5284 - 5494 and as per VIX is 5326 - 5492 with 5380 as the Pivot. Nifty opened huge negative around 5230 and hurtled down towards 5100 level within the first hour of trade. Common sense prevailed and the buyer came back to move the index back above the previous day’s close but ended the day flat at 5285.00, a miniscule loss of 2.45 points. The broader market though was very weak, with just 417 advances to 885 declines. With SMR at 46.27, PCR-OI Volume at 0.700, Bears seems to be in perfect position for Expiry. 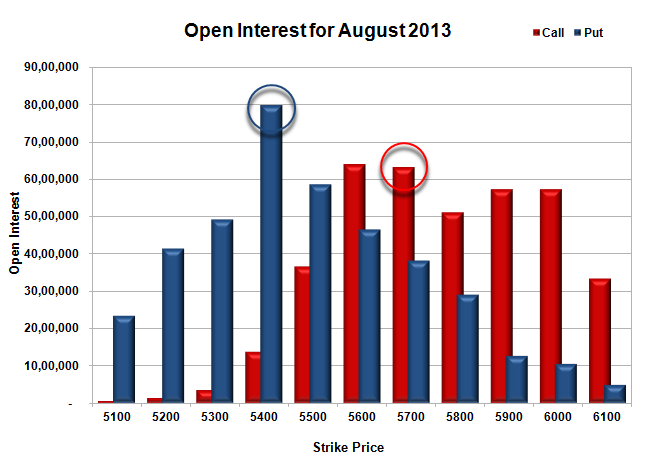 Call option 5100-5200 added 32.06 lacs huge amount of OI with profit booking seen at 5300 and above strike prices. Put option 5200-4800 added 37.91 lacs huge amount of OI with huge short covering seen at 5300 and above strike prices. Highest accumulation on Call option 5400 at 56.80 lacs & 5500 at 56.61 lacs whereas Put option 5200 at 72.72 lacs & 5100 at 55.35 lacs. Nifty Open Interest is at 1,77,38,950 down by 21,85,650, whereas Sep series added 30.52 lacs, with no change in price, most probably 100% rollover with huge short build-up in next series. Bank Nifty Open Interest is at 14,18,775 down by 3,39,375, whereas Sep series added 4.08 lacs, with decrease in price, most probably 100% rollover with huge short build-up in next series. FII’s sold 7.04 lacs Futures, mostly short build-up, as their net OI increased by 35244 contracts and the average price per contract comes to around 5119.69. FII’s future open contract as on date is 734717. PCR Open Interest (Volume) is at the lowest level at 0.700. 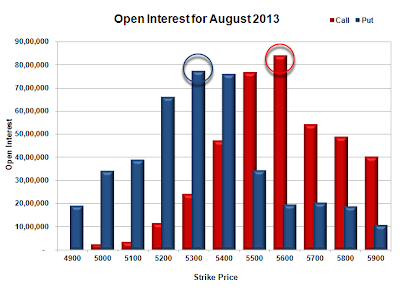 Best Support at 5200, with highest OI of 72.72 lacs, and below that at 5100 with huge OI of 55.35 lacs. Best Resistance at 5400, with huge OI of 56.80 lacs and above that at 5500 with OI of 56.61 lacs. Expiry Day Range as per Option Table is 5147 - 5357 and as per VIX is 5195 - 5375 with 5241 as the Pivot. Nifty opened huge negative and stayed weak breaking one psychological level after another to close below 5300 for the first time this year at 5287.45, a huge-huge loss of 189.05 points. The broader market was also very weak, with just 267 advances to 1053 declines. Option Table looks highly tilted towards the Sellers with expiry around the lows of the Series possible. Call option 5200-5400 added 58.09 lacs huge amount of OI with profit booking seen at 5500 and above strike prices. Put option 5200-5100 added 18.14 lacs huge amount of OI with huge short covering seen at 5400 and above strike prices. Highest accumulation on Call option 5500 at 68.14 lacs & 5400 at 62.47 lacs whereas Put option 5300 at 77.92 lacs & 5200 at 67.55 lacs. Nifty Open Interest is at 1,99,24,600 down by 14,45,350, whereas Sep series added 23.77 lacs, with huge decrease in price, most probably 100% rollover with huge short build-up in next series. Bank Nifty Open Interest is at 17,58,150 down by 5,54,800, whereas Sep series added 5.94 lacs, with huge decrease in price, most probably 100% rollover with small short build-up in next series. FII’s sold 10.19 lacs Futures, mostly short build-up, as their net OI increased by 30395 contracts and the average price per contract comes to around 5124.19. FII’s future open contract as on date is 699473. PCR Open Interest (Volume) has gone down to the lowest point of the series at 0.753. Support at 5300, though price just below it with highest OI of 77.92 lacs, below that at 5200 with huge OI of 67.55 lacs. Resistance now at 5400, with huge addition for the day at 19.76 lacs and above that at 5500 with highest OI of 68.14 lacs. Day Range as per Option Table is 5221 - 5417 and as per VIX is 5206 - 5369 with 5330 as the Pivot. Nifty opened positive and within minutes went up touch the highs of the day around 5530, but was sold off from thereon and was unable to sustain above 5500 to close flat near the lows at 5476.50, a miniscule gain of 4.75 points. The broader market was positive, with 758 advances to 563 declines. 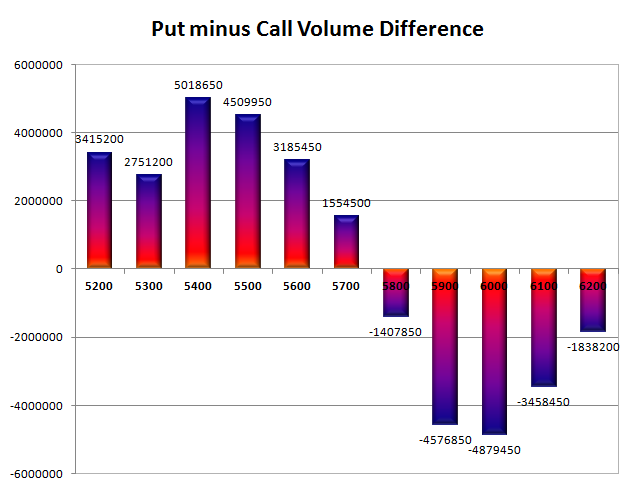 Based on Option Table, the range till expiry comes to 5300-5600. Call option 5800-5900 added 3.77 lacs huge amount of OI with short covering seen at 5500 and below strike prices. Put option 5500, 5300 added 18.11 lacs huge amount of OI with profit booking seen at 5200 and below strike prices. 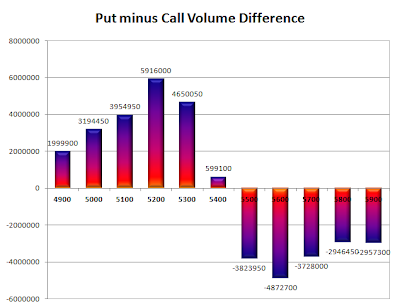 Highest accumulation on Call option 5600 at 83.57 lacs & 5500 at 68.34 lacs whereas Put option 5300 at 78.69 lacs & 5400 at 66.49 lacs. Nifty Open Interest is at 2,13,69,950 down by 19,12,350, whereas Sep series added 24.97 lacs, with no change in price, most probably 100% rollover with huge short build-up in next series. Bank Nifty Open Interest is at 23,12,950 down by 4,11,925, whereas Sep series added 4.18 lacs, with decrease in price, most probably 100% rollover with small short build-up in next series. FII’s sold 18.02 lacs Futures, mostly short build-up, as their net OI increased by 25969 contracts and the average price per contract comes to around 5311.00. FII’s future open contract as on date is 669078. 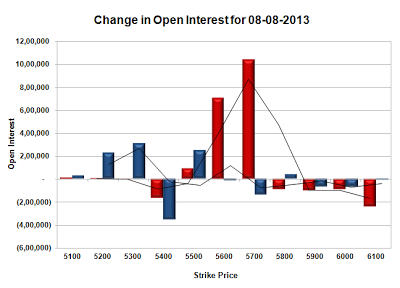 PCR Open Interest (Volume) stays weak at 0.873. Initial Support still at 5400, though covered huge but OI still above 66.49 lacs, below that at 5300 with highest OI of 78.69 lacs. Resistance very much at 5500, though covered huge but OI still above 68.34 lacs and above that at 5600 with highest OI of 83.57 lacs. 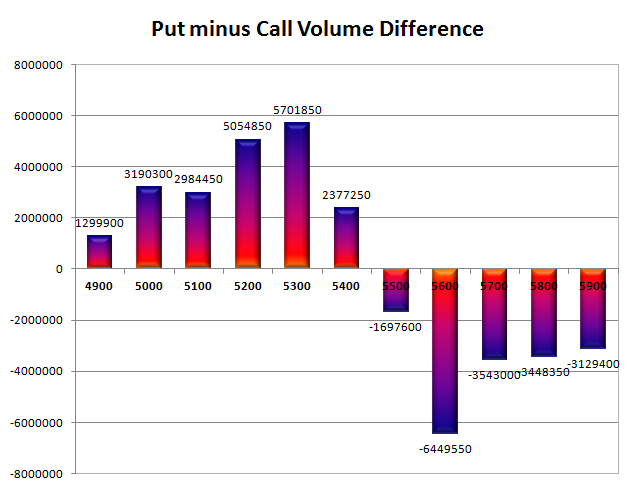 Day Range as per Option Table is 5394 - 5575 and as per VIX is 5401 - 5552 with 5487 as the Pivot. Nifty opened weak, and went down to touch the lows of the day around 5250 within the first few minutes of trade. The responsive buyer came back after many days of hibernation to move the index up by more than 150 points to close near the highs of the day at 5408.45, a huge gain of 105.90 points. The broader market was positive, with 762 advances to 526 declines. Based on Option Table the range developing for expiry is 5200-5600. 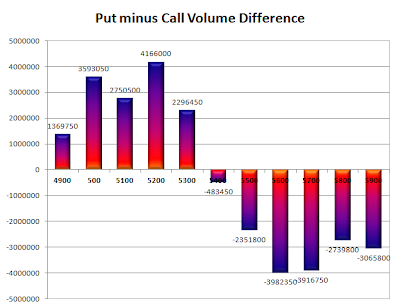 Call option 5500-5600 added 21.04 lacs huge amount of OI with short covering seen at 5300 and below strike prices. Put option 5400-5100 added 48.05 lacs huge amount of OI with short covering seen at 5500 and above strike prices. Highest accumulation on Call option 5600 at 68.93 lacs & 5500 at 68.44 lacs whereas Put option 5300 at 79.56 lacs & 5200 at 72.91 lacs. 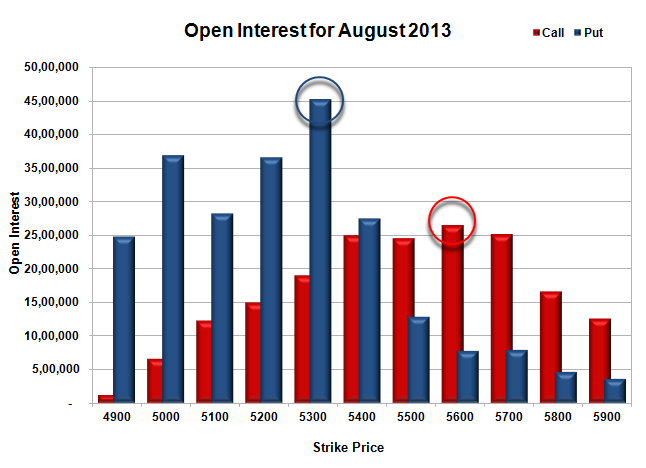 Nifty Open Interest is at 2,35,45,950 down by 6,85,100, with increase in price, most probably huge short covering. Bank Nifty Open Interest is at 29,10,225 up by 3,45,100, with not much change in price, most probably short build-up. FII’s sold 14.55 lacs Futures, mostly short build-up in Bank Nifty Future, as their net OI increased by 24537 contracts and the average price per contract comes to around 5260.64. FII’s future open contract as on date is 653356. PCR Open Interest (Volume) moved up at 0.869. 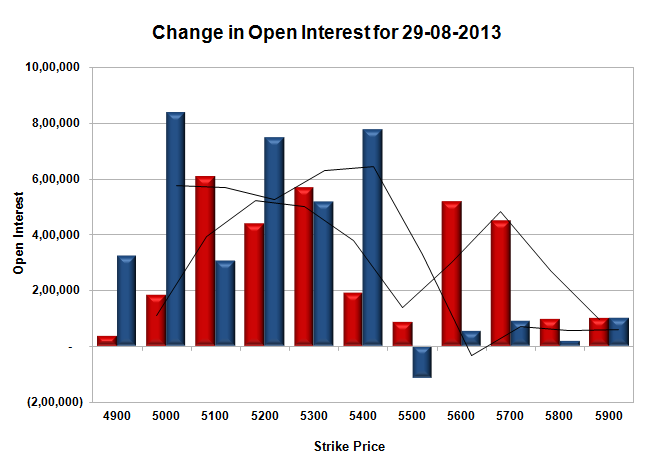 Best Support now at 5300, with highest OI of 79.56 lacs, below that at 5200 with OI of 72.91 lacs. 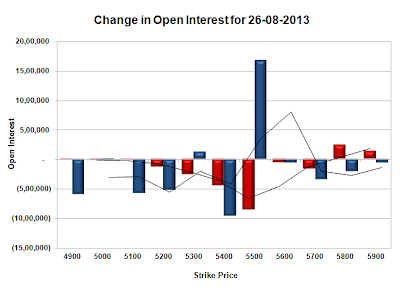 Resistance at 5500, with OI of 68.44 lacs and above that at 5600 with highest OI of 68.93 lacs. Day Range as per Option Table is 5273 - 5474 and as per VIX is 5326 - 5491 with 5360 as the Pivot. Nifty opened huge up around the 5500 level on the back of RBI induced liquidity steps taken yesterday but started selling-off straight way. The index weakened with each passing hour to move in negative and closed near the lows of the day at 5302.55, a huge loss of 98.90 points from the morning gain of 93 points. The broader market was also weak, with just 427 advances to 863 declines. Highest addition for the day was at 5300CE. Call option 5100-5300, 5500-5600 added 40.72 lacs huge amount of OI with profit booking seen at 5700 and above strike prices. Put option 5200, 5000-4900 added 27.40 lacs huge amount of OI with huge short covering seen at 5300 and above strike prices. Highest accumulation on Call option 5700 at 68.19 lacs & 5600 at 61.85 lacs whereas Put option 5300 at 66.97 lacs & 5200 at 55.76 lacs. 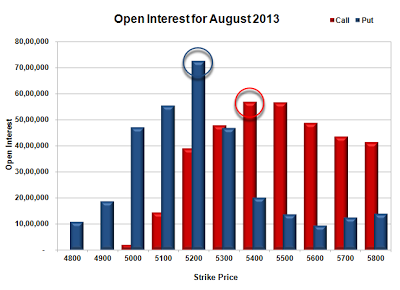 Nifty Open Interest is at 2,42,31,050 up by 34,44,800, with decrease in price, most probably huge short build-up. 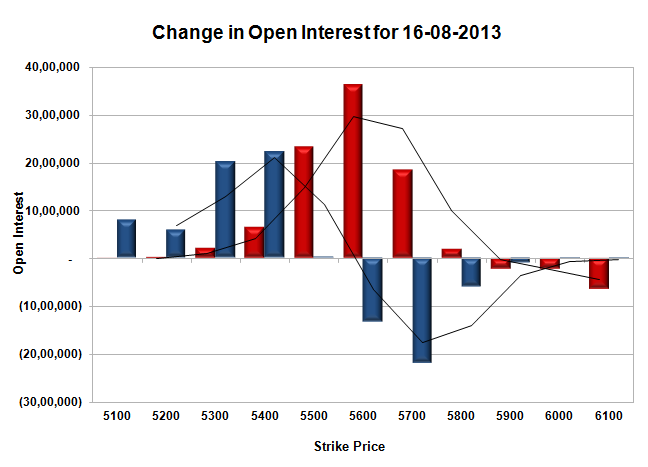 Bank Nifty Open Interest is at 25,65,125 down by 71,375, with increase in price, most probably small short covering. FII’s bought 5.23 lacs Futures, mostly long build-up, as their net OI increased by 69943 contracts and the average price per contract comes to around 5179.53. FII’s future open contract as on date is 628819. PCR Open Interest (Volume) is at the lowest point of the series at 0.779. 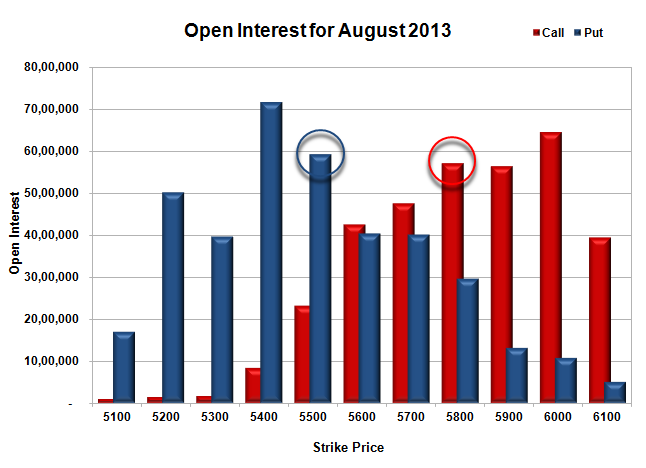 Support still at 5300, though covered huge but net OI still above 66.97 lacs, below that at 5200 with OI of 55.75 lacs. 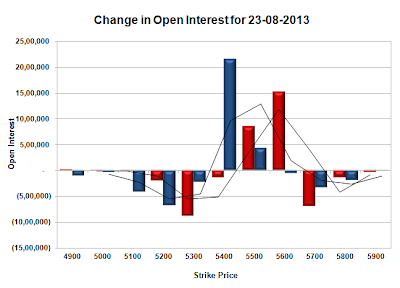 Resistance at 5400, with OI of 53.14 lacs and above that at 5500 with huge OI of 54.49 lacs. 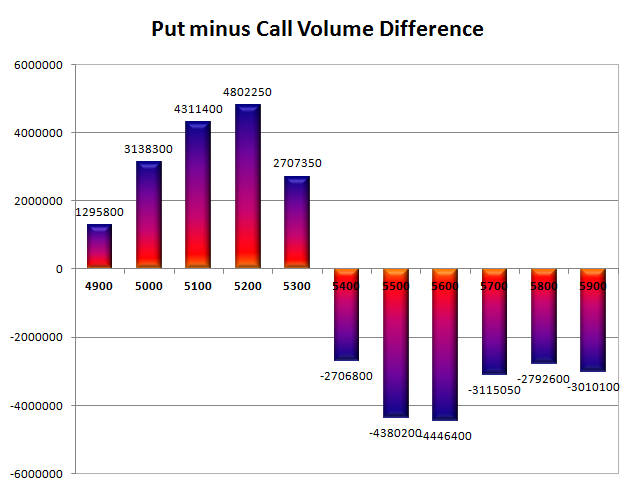 Day Range as per Option Table is 5247 - 5441 and as per VIX is 5225 - 5381 with 5358 as the Pivot. Nifty opened weak on the back of bad global cues, and some huge selling saw the Nifty index suffer its biggest percentage drop since July 2009. The index lost 234.45 points or around 4.08% to close at the low points of the day at 5507.85 after making a low at 5496.05. On a week on week basis Nifty lost 57.80 points. The broader market was pathetic, with just 190 advances to 997 declines. Highest addition for the day was at 5600CE, which looks like a super resistance for the week. 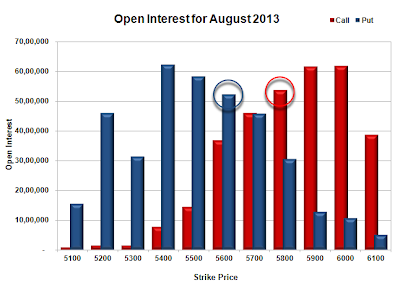 Call option 5300-5800 added 88.27 lacs huge amount of OI with profit booking seen at 5900 and above strike prices. Put option 5500-5100 added 56.62 lacs huge amount of OI with huge short covering seen at 5600 and above strike prices. Highest accumulation on Call option 5600 at 64.07 lacs & 5700 at 63.08 lacs whereas Put option 5400 at 79.79 lacs & 5500 at 58.56 lacs. 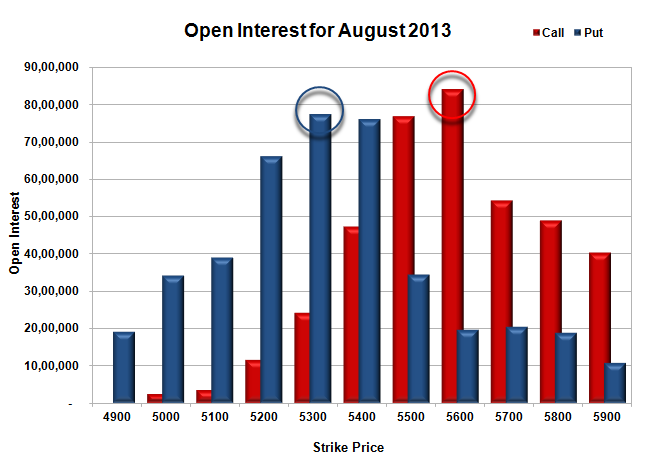 Nifty Open Interest is at 1,76,16,800 up by 27,12,300, with decrease in price, most probably huge short build-up. Bank Nifty Open Interest is at 24,28,525 up by 11,475, with huge decrease in price, most probably small short build-up. FII’s sold 17.59 lacs Futures, mostly short build-up, as their net OI increased by 52040 contracts and the average price per contract comes to around 5354.41. FII’s future open contract as on date is 463290. PCR Open Interest (Volume) is stable at 0.970. 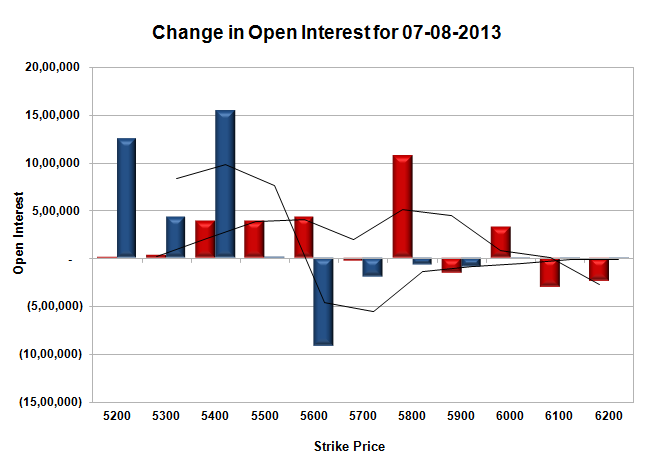 Support now down to 5500, with OI of 58.56 lacs, below that at 5400 with highest OI of 79.79 lacs. 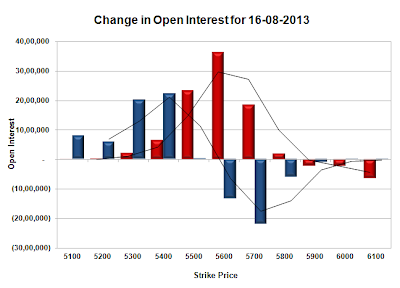 Best resistance now at 5600, with OI of 64.07 lacs and above that at 5700 with huge OI of 63.08 lacs. 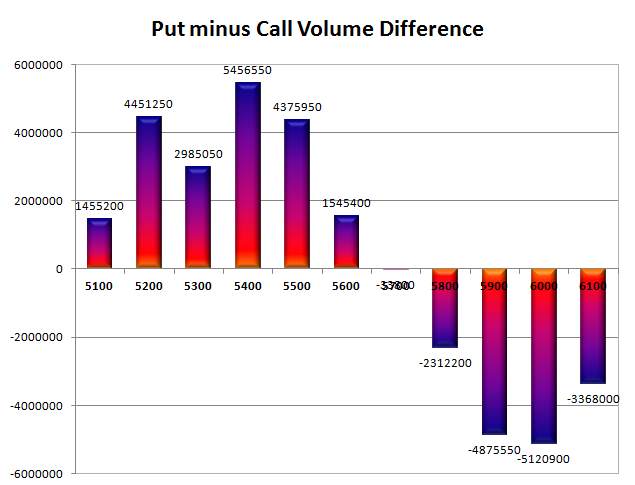 Day Range as per Option Table is 5475 - 5639 and as per VIX is 5440 - 5576 with 5574 as the Pivot. Nifty opened flat just above the previous day’s close but saw buying interest in the initial stages to be sold off during the mid session and closing with a flurry at 5742.30, a good gain of 43.00 points. Nifty in the last 4 trading session has covered more than 40 % of the fall from 6093 to 5487. The broader market was just positive, with 673 advances to 513 declines. Highest addition for the day was at 5700PE, which looks more like buying than selling. Call option 6100 added 0.88 lacs OI with short covering seen at 5700 and below strike prices. Put option 5900-5600 added 27.57 lacs huge amount of OI with profit booking seen at 5400 and below strike prices. Highest accumulation on Call option 6000 at 59.51 lacs & 5900 at 59.48 lacs whereas Put option 5700 at 60.25 lacs & 5600 at 59.76 lacs. 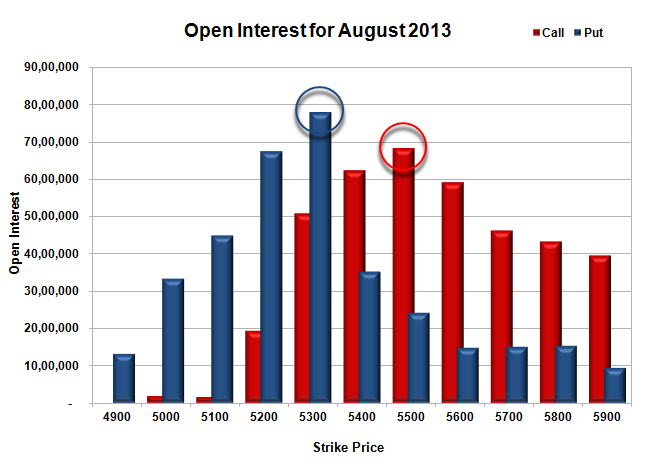 Nifty Open Interest is at 1,49,04,500 up by 11,19,250, with increase in price, most probably huge long build-up. 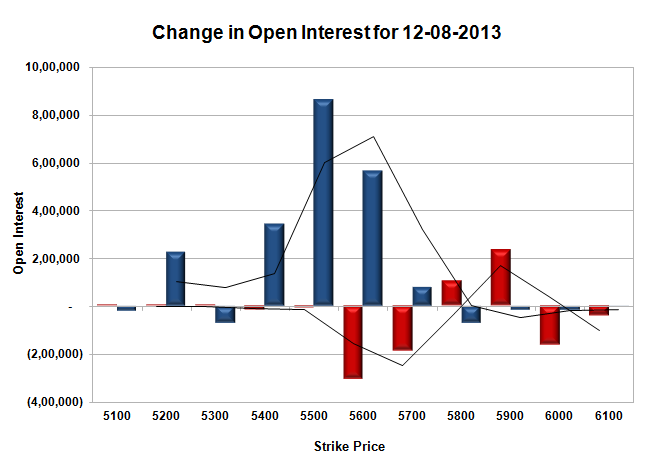 Bank Nifty Open Interest is at 24,17,050 down by 8,600, no change in price, most probably small short covering. FII’s sold 12.09 lacs Futures, mostly short build-up, as their net OI increased by 24379 contracts and the average price per contract comes to around 5605.32. FII’s future open contract as on date is 411250. PCR Open Interest (Volume) is stable at 1.100. Support now up at 5700, with huge OI addition for the day at 14.55 lacs and highest OI of 60.25 lacs, below that at 5600 with OI of 59.76 lacs. 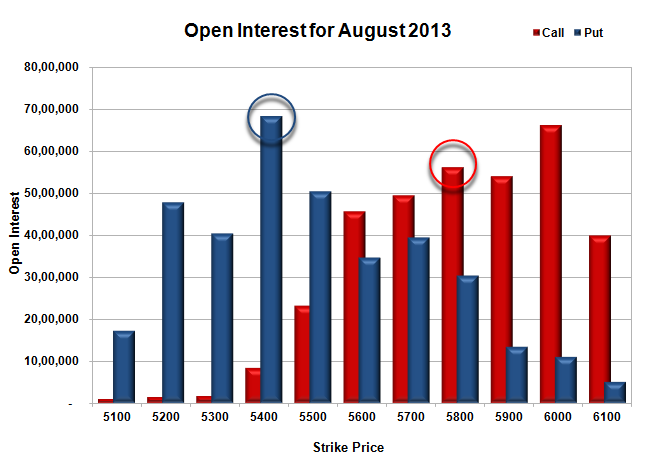 Initial resistance still at 5800, with OI of just 49.28 lacs and above that at 5900 with huge OI of 59.48 lacs. Day Range as per Option Table is 5665 - 5799 and as per VIX is 5686 - 5799 with 5729 as the Pivot. Nifty opened flat just below the previous day’s close but saw huge buying from thereon to move the index by 100 points, making a high of 5704.75, but closed just below 5700 at 5699.30, a huge gain of 86.90 points. Nifty in the last 3 trading session has gained 180.2 points. The broader market was also positive, with 807 advances to 378 declines. Highest addition for the day was at 5600PE, which could act as good support in the coming days. Call option 5900 added 5.08 lacs huge amount OI with short covering seen at 5700 and below strike prices. Put option 5800-5600 added 18.21 lacs huge amount of OI with profit booking seen at 5500 and below strike prices. Highest accumulation on Call option 6000 at 61.95 lacs & 5900 at 61.56 lacs whereas Put option 5400 at 62.34 lacs & 5500 at 58.28 lacs. 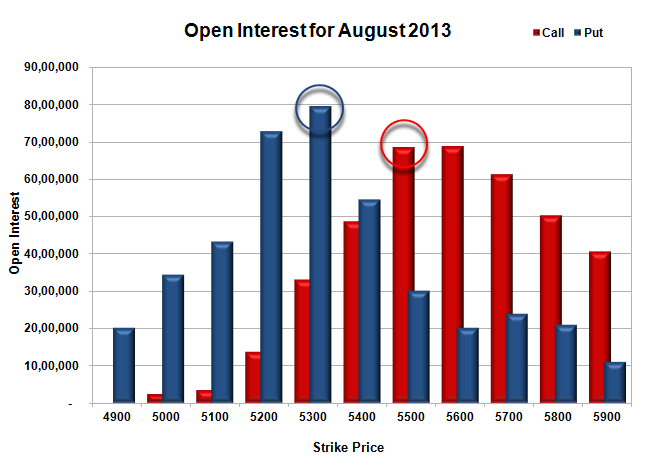 Nifty Open Interest is at 1,37,85,250 down by 8,48,600, with increase in price, most probably huge short covering. 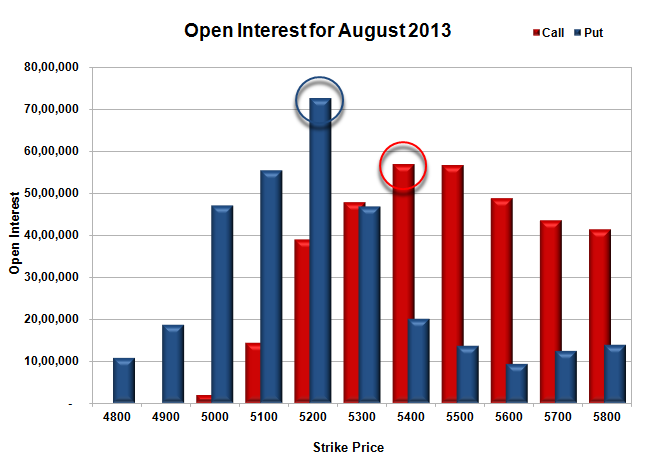 Bank Nifty Open Interest is at 24,25,650 up by 5,050, with increase in price, most probably small long build-up. FII’s sold 5.11 lacs Futures, mostly long liquidation, as their net OI decreased by 23622 contracts and the average price per contract comes to around 5558.68. FII’s future open contract as on date is 386871. PCR Open Interest (Volume) after many days is back above 1 at 1.021. 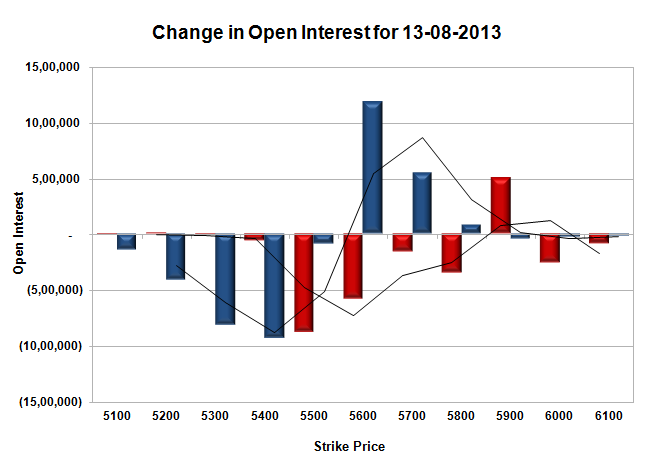 Support has moved up to 5600, with huge OI addition for the day at 11.87 lacs and below that 5500 with OI of 58.28 lacs. 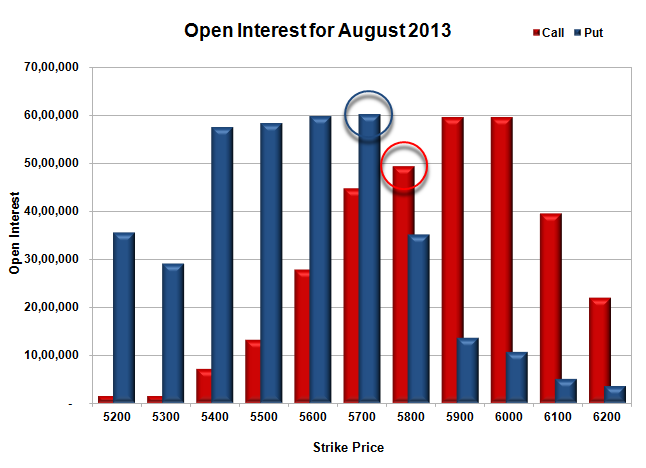 Initial resistance now at 5800, with OI of just 53.71 lacs and above that at 5900 with huge OI of 61.56 lacs. 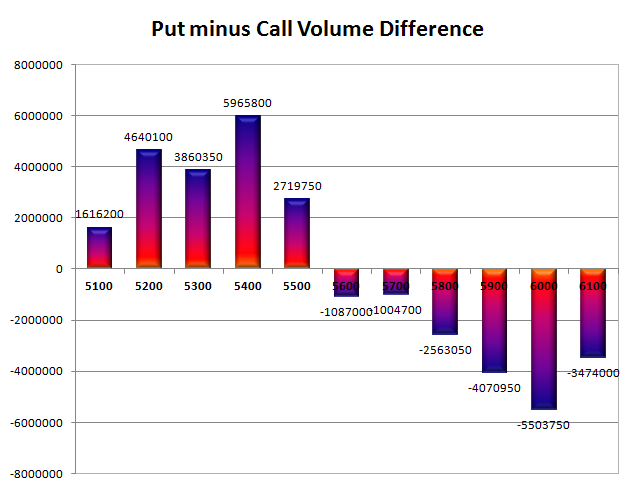 Day Range as per Option Table is 5600 - 5742 and as per VIX is 5642 - 5757 with 5661 as the Pivot. Nifty for a change opened up above 5600 level but saw a dip below 5560 within the first hour of trade. The responsive buyers took control from thereon to move the index to the highs of the day at 5644 but profit booking saw the index close at 5612.40, still a good gain of 46.75 points. The broader market was positive, with 854 advances to 342 declines. Solid Support is developing around 5400 level. Call option 5800-5900 added 3.40 lacs huge amount OI with short covering seen at 5600 and below strike prices. Put option 5700-5400, 5200 added 20.75 lacs huge amount of OI with short covering seen at 5800 and above strike prices. Highest accumulation on Call option 6000 at 64.55 lacs & 5800 at 57.14 lacs whereas Put option 5400 at 71.65 lacs & 5500 at 59.18 lacs. 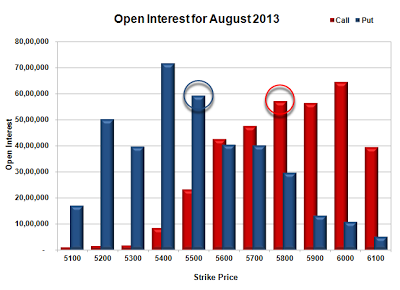 Nifty Open Interest is at 1,46,33,850 down by 12,01,100, with increase in price, most probably short covering. Bank Nifty Open Interest is at 24,20,600 up by 57,425, with decrease in price, most probably huge short build-up. FII’s sold 1.74 lacs Futures, mostly long liquidation, as their net OI decreased by 3567 contracts and the average price per contract comes to around 5463.07. FII’s future open contract as on date is 410493. 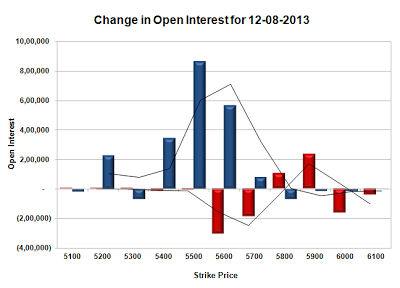 PCR Open Interest (Volume) is just below 1 at 0.987. Support at 5500 got better, with OI now at 59.18 lacs, and below that at 5400 with highest OI of 71.65 lacs. 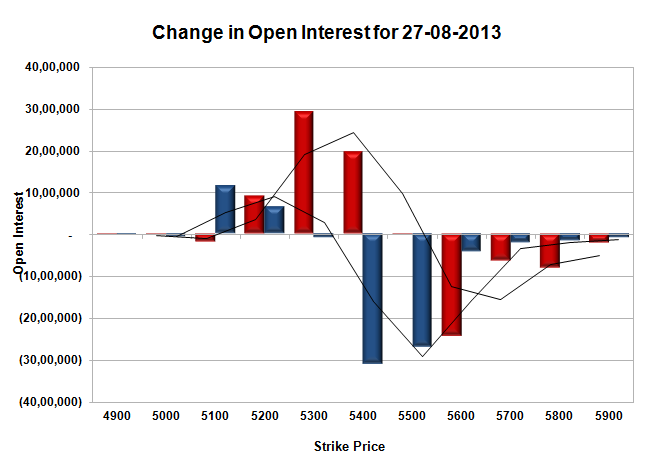 Initial resistance now at 5700, with OI of 47.61 lacs and above that at 5800 with huge OI of 57.14 lacs. 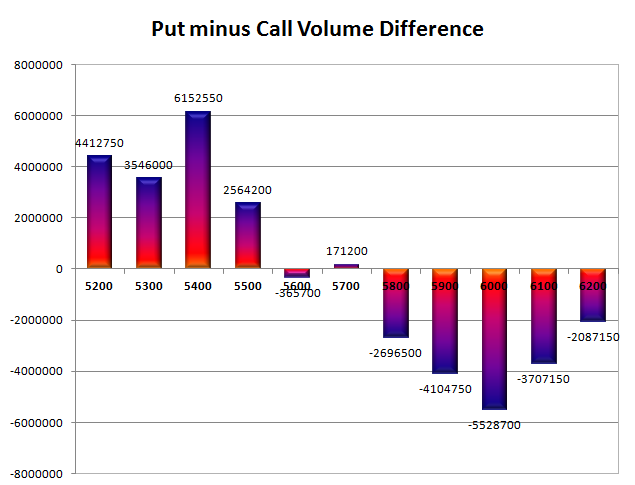 Day Range as per Option Table is 5539 - 5674 and as per VIX is 5550 - 5675 with 5605 as the Pivot. Nifty opened flat and saw the buyers back after many days of hiatus to move the index higher with each passing hour to end near the highs of the day at 5565.65, a good gain of 46.55 points. On a week on week basis the index though lost 112.25 point or around 1.98%. The broader market was positive, with 824 advances to 346 declines. Overhead resistance is getting stronger at 5700 level. Call option 5500-5700 added 18.38 lacs huge amount OI with profit booking seen at 5800 and above strike prices. Put option 5500, 5300-5200 added 7.84 lacs huge amount of OI with short covering seen at 5700 and above strike prices. 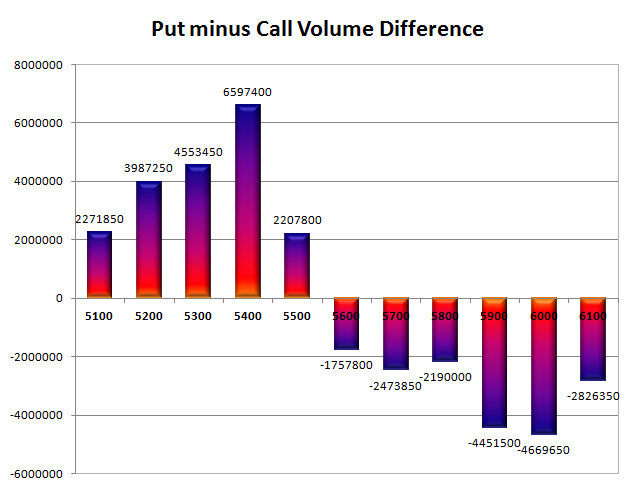 Highest accumulation on Call option 6000 at 66.16 lacs & 5800 at 56.09 lacs whereas Put option 5400 at 68.21 lacs & 5500 at 50.55 lacs. 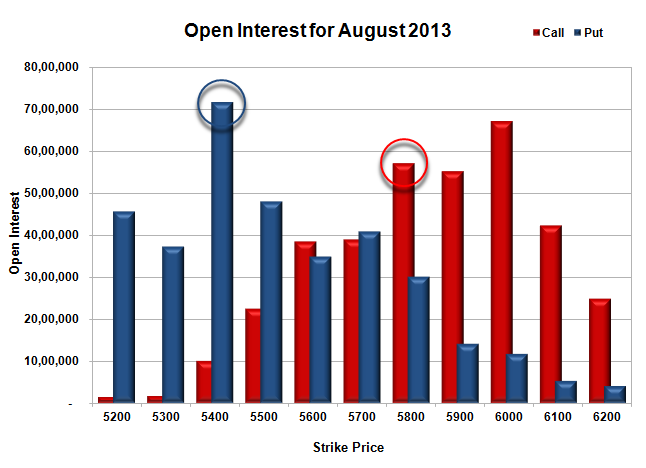 Nifty Open Interest is at 1,58,34,950 up by 2,66,550, with increase in price, most probably long build-up. Bank Nifty Open Interest is at 23,63,175, down by 36,900, with increase in price, most probably huge short covering. FII’s bought 7.36 lacs Futures, mostly long build-up, as their net OI increased by 4731 contracts and the average price per contract comes to around 5456.85. 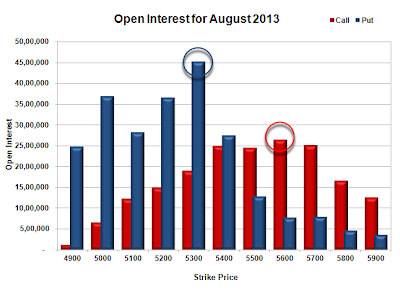 FII’s future open contract as on date is 414060. PCR Open Interest (Volume) is still below 1 at 0.934. Initial support at 5500, with OI of 50.55 lacs, and below that at 5400 with highest OI of 68.21 lacs. 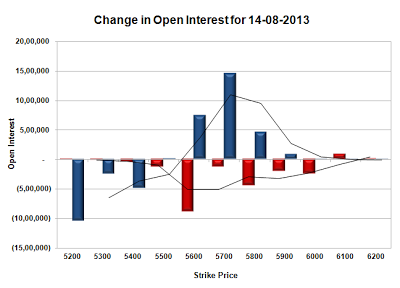 Initial resistance at 5600, with OI of 45.63 lacs and above that at 5700 with OI of 49.48 lacs. Day Range as per Option Table is 5489 - 5622 and as per VIX is 5504 - 5627 with 5522 as the Pivot. Nifty opened flat and after an initial dip below 5500 level stayed within a narrow range of 40 points for the better part of the day. It moved once toward 5560 level which was sold off and the index closed at 5519.10, a small loss of 23.15 points. The broader market after many days was positive, with 728 advances to 441 declines. Support building up around 5400 level for the time being. Call option 5400-5800, 6000 added 25.71 lacs huge amount OI with profit booking seen at 6100 and above strike prices. Put option 5400-5200 added 32.20 lacs huge amount of OI with short covering seen at 5600 and above strike prices. Highest accumulation on Call option 6000 at 67.08 lacs & 5800 at 57.02 lacs whereas Put option 5400 at 71.76 lacs & 5500 at 48.08 lacs. Nifty Open Interest is at 1,55,68,400 down by 11,31,000, with decrease in price, most probably huge-huge long liquidation. 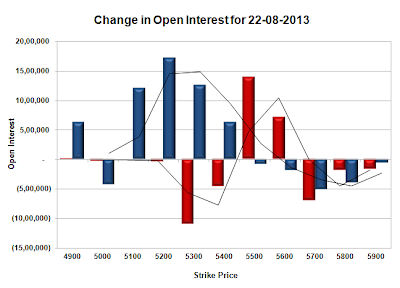 Bank Nifty Open Interest is at 24,00,075, down by 78,650, with increase in price, most probably huge short covering. FII’s sold 9.33 lacs Futures, mostly long liquidation, as their net OI decreased by 34652 contracts and the average price per contract comes to around 5420.67. FII’s future open contract as on date is 409329. PCR Open Interest (Volume) is at 0.946. 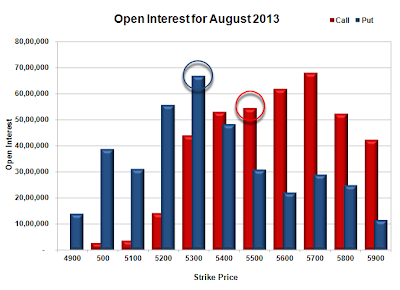 Initial support still at 5500, with OI of 48.08 lacs, and below that at 5400 with highest OI of 71.76 lacs. 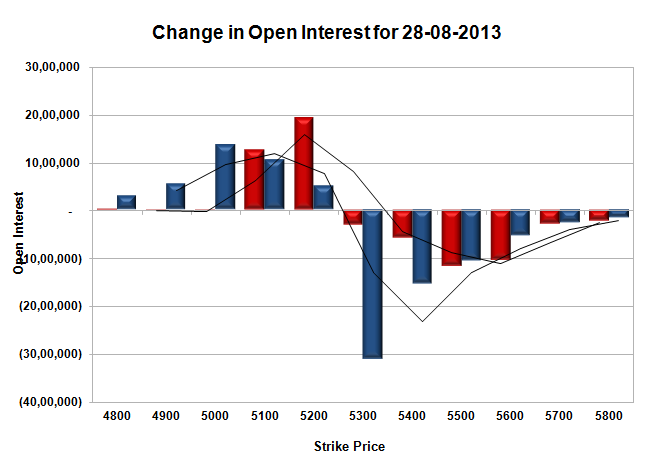 Initial resistance at 5600, with OI of 38.55 lacs and above that at 5800 with huge OI of 57.02 lacs. Day Range as per Option Table is 5453 - 5592 and as per VIX is 5455 - 5583 with 5522 as the Pivot.